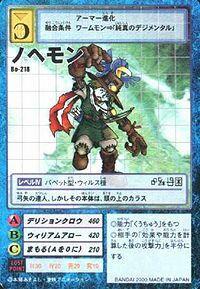 An Armor-level Puppet Digimon that evolved through the power of the "Digimental of Purity". 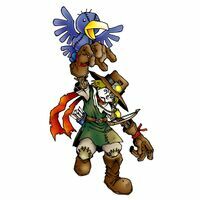 It is a Digimon which has an appearance like a scarecrow, but in actuality, the crow on its right arm is its true form. Due to the crow's psychic abilities, it skillfully manipulates the scarecrow, bewildering the enemy. Since a cunning crow is its true form, telling lies and exaggerated things is its speciality, but it is also an expert archer who never misses. 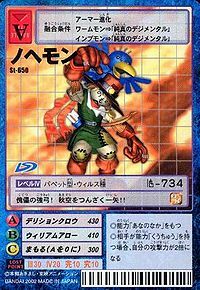 Its Special Move is the crow, its true form, causing the opponent to completely lose their fighting spirit using its derisive way with words and laughter (Derision Crow). 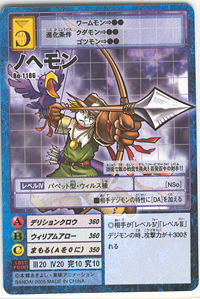 Special Move - Causes the opponent to lose their fighting spirit using the crow's way with words and laughter (Derision Crow). This page was last modified on 16 April 2019, at 14:50.